An early work from Brian De Palma, the 1973 SISTERS is still one of his best, and the film that effectively defined what we have come to know as 'a Brian De palma film'. Slarek revels in the Blu-ray from Arrow's fine dual format release. Fortune and critical approval have not always favoured Brian De Palma. Back in 1979 he was lumped in with fellow filmmakers Francis Coppola, Steven Spielberg, Martin Scorsese, John Milius and George Lucas and collectively and unflatteringly labelled 'The Movie Brats' by film writers Michael Pye and Linda Myles. These were the new generation of Hollywood directors, they proposed, ones who had learned their craft primarily from watching other people's movies rather than working their way up through the studio system as their idols had. And although this sextet were only a sampling of the hot young directors who could have been so categorised at the time, they were seen as the standard bearers, the ones who had landed the big movie deals and were making exciting and important movies and making them their way, "the kids with the beards" that William Holden laments in Billy Wilder's Fedora. At the time of the book's publication all five were hot property, but while Scorsese and Spielberg have continued to score critical or box-office success, and just occasionally both, Coppola appears to have long since lost his edge, Milius has fallen victim to changing tastes and his own ill health, while Lucas long ago became stuck in a Star Wars loop from which he seems unlikely to ever escape. But what of De Palma? He'd been making films for sixteen years before hitting a home run with Carrie and then delivered a string of dark thrillers and a misfired comedy (Home Movies) before scoring big again with The Untouchables. For the first time in a while, De Palma was seen as a bankable director. Then three years later he directed The Bonfire of the Vanities, a catastrophe of almost epic proportions. It's been a similar story since, with the box-office gold of Mission: Impossible followed by the hysteria of Snake Eyes and the science fiction silliness of Mission to Mars. It was shortly after the publication of Pye and Myles's book that the National Film Theatre ran a 'Movie Brats' season, in which they screened all of the available early works by this hallowed group of filmmakers. For those of us who only knew them by their high profile box-office hits, this was a thrilling opportunity to catch some rarely screened and occasionally unheard of films. The timing was also perfect, running during college holidays when I was working in London only a short walk from the NFT, enabling me to catch almost every screening. And it proved an intriguing and often enlightening experience. You could see Spielberg laying the foundations for the tension in Jaws in his TV movies Something Evil and the brilliantly minimalist Duel, Scorsese was dry-running Mean Streets in the raw and energetic Who's That Knocking at My Door?, and George Lucas had already shown a real flair for science fiction with THX-1138. But where was the Brian De Palma we knew from Carrie and The Fury? Greetings and Hi, Mom! 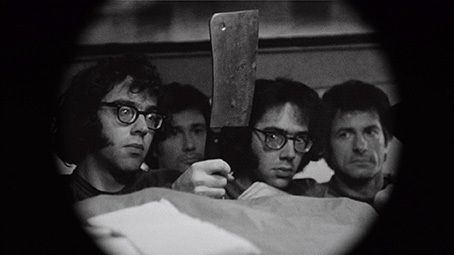 were entertaining and inventive films, but gave no indication that their creator was going to make his name as a director of horror-tinged thrillers. It was then that I saw Sisters – or Blood Sisters is it had been crudely retitled back then – and everything fell into place. This was the movie that first encapsulated what we now tend to think of as a Brian De Palma film, a dark but still playful and stylishly made Hitchockian thriller that directly referenced the master's works and whose memorable set-pieces were sometimes shocking and bloody. The film sets up one of its and De Palma's key concerns, that of the nature and consequences of voyeurism, in the playful opening sequence, as a pretty blind girl walks into a male changing room by mistake and starts to undress. The room's sole male occupant is thus presented with an interesting dilemma – should he alert the girl to his presence, stand quietly and watch, or leave to protect her privacy. After observing her for a short while, he elects to depart. It's then that the whole thing is revealed to be a set-up by a Candid Camera-esque show known as 'Peeping Toms'. The victim of the gag was kind-hearted advertising salesman Phillip (Lisle Wilson), while the blind girl was played by French-Canadian model and aspiring actress Danielle (Margot Kidder, appropriately sweet at first but firing on all cylinders in moments of confused trauma). Phillip wins a dinner date for two for his chivalry, and Danielle persuades him to invite her along, but the meal is interrupted by Danielle's ex-husband Emil (a wonderfully creepy William Finley), who demands that Danielle leave the restaurant with him. Phillip has him ejected, and when he follows the pair back to Danielle's apartment, Phillip tricks him into believing that he has gone home and secretly returns to spend the night in Danielle's bed. As Phillip is dressing the following morning he overhears Danielle arguing about him in French with her twin sister Domnique, who is visiting for their birthday. Danielle apologises to Phillip and reveals she is feeling unwell and is down to the last two pills she is required to take for an unspecified medical condition. She asks him to collect some more from the local pharmacy, but while he is gone she is stricken by pain but is unable to locate those last two pills, which she left on the bathroom sink and were unknowingly knocked down the drain by Phillip. Her only hope is that Phillip will return quickly with the fresh supply, but wanting to surprise the sisters he has stopped off at a bakery to buy them a personalised birthday cake. What follows is an object lesson into how to grind the audience into its seat, as high angle shots of Danielle writhing in pain on the bathroom floor are cross-cut with the painfully slow process of lettering the cake to Phillip's exact specification, shot in big close-up and time-cheat edited to emphasise the potentially catastrophic effects of this delay. It's here that I have a problem, not with the film but with discussing in any detail what happens next. The thing is that the scene I'm apprehensive about describing is a pivotal one, the kicking-off point for the narrative proper and a perfect example of De Palma's cinematic bravura at its most purposeful. It's nigh-on impossible to talk about Sisters in any detail without covering the content and handling of this sequence, but it also delivers the film's biggest narrative surprise, and if you've not seen the film before then it's going to work far better if you go in cold. So here's the deal. If you want to avoid spoilers then hop forward two paragraphs, and do it now. Even if you just throw a glance at the paragraph below you're likely to see a word or two that will clue you in to what you don't yet want to know. OK, you've been warned. The rest is on you. I don't actually need to get too specific here, but even a vague outline will allow you to work out what happens, although I'm guessing the specifics will still give you a jolt, particularly a moment we mercifully only see in shadow. What takes place in Danielle's apartment is a brutal and bloody murder, probably involving her sister Dominique, one that is witnessed from an apartment opposite by newspaper columnist Grace Collier (a sparky Jennifer Salt, now a producer on American Horror Story). 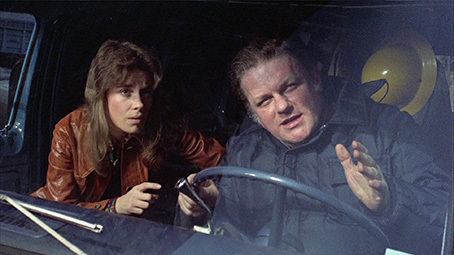 Collier calls the police, but in a lovely bit of cinematic economy (framed newspaper clippings, a remark over the phone about one of her stories), De Palma establishes that she is one person that the two detectives who respond to the call are not predestined to believe or enthusiastically cooperate with. And with this plausibly presented delaying tactic in place, our intrepid director takes an almighty risk by presenting almost all of what follows in split screen. On one side we have Grace trying to convince the police that what she witnessed is for real and leading them to the apartment, and on the other we have Danielle and Emil working frantically to cover up all traces of the crime. Technically, it's a dazzler, but unlike just about any other example of this technique I can readily recall (including its use by De Palma at the otherwise dynamite climax of Carrie), it works for the storytelling than against it. Far from dissipating the tension it seriously heightens it, in the process playing games with our loyalties as we find ourselves both rooting for Grace in her verbal conflict with the cynical detectives and secretly urging Emil and Danielle to step up the pace if they are going to complete their task before the cops knock on their door. De Palma's command of this technique reaches a peak in the apartment block corridor when the two stories almost physically collide, and characters disappear from one side of the screen and immediately appear on the other. On my first viewing of the film, this was the sequence that stayed with me for years until my belated second viewing on VHS tape. With no evidence left of the crime, the cutely-accented Danielle feigning sleepy and smiling innocence, and Grace getting increasingly on the detectives' nerves, the whole thing is dismissed as a product of the writer's attention-seeking invention. Unwilling to let it lie, Grace follows her journalistic instincts and investigates the crime herself, enlisting the help of private detective Joseph Larch (the always reliable Charles Durning). While Larch follows the sofa in which the pair are sure that the body is hidden, Grace digs into the background of Danielle and her mysterious sister, enquiries that ultimately place her own life in danger. As with the 1976 Obsession, De Palma here wears his Hitchcock borrowings on his sleeve, but after making such a splash with his showcase scene, he plays it largely straight for the investigation that follows. He still peppers the proceedings with offbeat character moments (the long improvised shot of Grace sharing a car with her advice-dispensing mother, played by Salt's real-life mother Mary Davenport, is a memorable example) and occasional whiffs of black humour, and seriously cranks up the tension when Grace follows a lead to a psychiatric hospital and becomes trapped in a metaphorical spider's web. It's here that the experimentalist elements of De Palma's earlier work are given full reign, peaking in a drug-induced monochrome nightmare that is more indebted to Polanski than Hitchcock. De Palma is well served by a cast he was personally close to, including friends William Finley and Jennifer Salt and his then girlfriend (and Salt's housemate) Margot Kidder. Technical polish is provided by cinematographer Gregory Sandor and editor Paul Hirsch, who began his career with De Palma on Hi, Mom! and went on to win an Oscar for his work on Star Wars. Possibly the biggest gamble is a score from Hitchcock regular Bernard Herrmann that at times sounds as if the composer was encouraged by De Palma to throw all caution to the wind, with subtle and even familiar cues giving way to outlandish Moog wails that nontheless somehow seem right for the film, an explosion of musical expressionism that textures every scene and makes this low-budget work feel like a bigger production than it actually was. In the past few years, De Palma's dark 80s thrillers have been championed in some quarters as minor masterpieces, but try though I might, I find myself still unable to wholeheartedly embrace them. My reasons are my own, but I have seen them echoed by other reviewers, and I freely admit that I tend to have a particular fondness for early career films, ones that were often the result of energetic determination rather than studio deals and in which you can see the filmmakers defining their style and honing their skills. But even with that in mind, watching Sisters again after a gap of several years I was surprised just how well it stood up against the director's more widely seen and higher budgeted later work. It's tense, inventive, tightly directed and smartly performed, and has none of the excesses or creative missteps that for me hamstring later works like Body Double or Dressed to Kill. The result is, for my money at least, one of De Palma's most complete and satisfyingly films, and an object lesson in how to take inspiration from Hitchcock rather than just rip him off. Don't be fooled by the opening American International logo, which flickers and dances with coarsely renedered grain, as the transfer on the film itself is well up to Arrow's usual high standards. Sourced from an HD master prepared and delivered by Criterion in cooperation with Ed Pressman, additional picture restoration work was carried out using a combination of software tools and techniques at Deluxe Digital – EMEA, London, under the supervision of James White. The improvements over the previous Criterion DVD release are immediately apparent, particularly in the low light scenes, which boast a crisper and richer feel than their SD counterparts, while the increased resolution can be clearly seen in the wide shot at the pharmacy when Phillip is buying Danielle's medication – labels on bottles that are a blur on the DVD are clearly legible here. Contrast and colour are both very good and remaining dust spots from the DVD transfer appear to have been cleaned up. Grain is visible throughout, but dramatically increases on the famous late film fisheye shot of Emil and the monochrome hallucination sequence – this is deliberate, the result of shooting these shots on 16mm rather than 35mm to give them a distinctive tone. The framing is 1.78:1, as it was on the Criterion DVD. The Linear PCM Mono 2.0 48K soundtrack has a slight treble bias and lack of strong bass common in non-studio, pre-Dolby films of the period, but otherwise is in fine shape, with even the more explosive cues in Herrmann's score not distorting or breaking up. Optional SHD English subtitles for the hearing impaired have been included. A fascinating, well researched and detailed examination of the film, its production and its themes by critic Justin Humphreys, purposefully illustrated by stills and film clips. Humphreys covers some crucial ground in considerable depth here, including the film's fascination with voyeurism, the influence of key Hitchcock films (which he illustrates with specific comparisons), the actors, the use of split screen, and the inclusion of conjoined twins in western cinema. 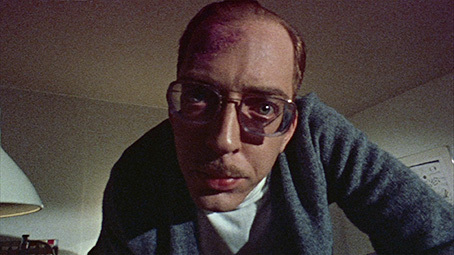 He wonderfully describes Emil at one point as looking like a cross between John Waters and Heinrich Himmler, and even provides background on some of the performances in the hallucination sequence. An academic extra perhaps, but an excellent one. Lead player Salt talks about living with Margot Kidder (and De Palma, who was dating her at the time), getting the script as a Christmas present, Margot's ease with the French-Canadian accent, shooting split screen, improvising with her mother, working long hours and more. Co-screenwriter Louisa Rose covers in some detail how she came to writing via acting, meeting Brian De Palma (and William Finley) while doing her masters degree, and working on the script for Sisters. She intriguingly describes movie storylines as more like dreams and feels plays tend to have a more logical structure, and reflects on a couple of ideas used in the film that I can't reveal here without getting back into spoiler territory. Award-winning editor Paul Hirsch (the camera is framed with more head room than would be normal to include his Oscar for Star Wars behind him) has plenty of interesting stories, including meeting and working with De Palma on Hi, Mom!, and how temp tracking the scenes with the music from Psycho prompted him to suggest that they hire Bernard Herrmann to write the score. He regards De Palma and an heir to Hitchcock rather than an imitator and suggests the two men have similar personalities, and having suggested a tagline for the film's poster, he is scathing about the thinking of the movie people who made just one small but oh-so significant change. A shorter interview with unit manager Jeffrey Hayes, whose first feature this was. He describes is as a physically hard shoot, there were apparently no psychological dramas because everyone loved the script and the project. In an extract from a 2009 phone interview conducted by Justin Humpheys, The lovely William Finley recalls how the film came about and how organised the shoot was, playing Emil and hanging out in the old days with the other movie brats. Critic Mike Sutton takes us on a comprehensive and consistently interesting trip through the director's film career. Illustrated with clips when Arrow have the home video rights and stills when they don't, it would make for a fine introduction to his filmography for newcomers. As a fan of De Palma's work, Sutton tends to find good in almost everything he's done and we'll agree to disagree on some of his assessments, but this is still a fine extra. An intriguing sell that makes the film look a lot stranger than it actually is. I'd certainly buy a ticket. A fascinating collection of international posters – including a particularly grisly Spanish (or possibly Mexican) one – and Spanish front-of-house cards. An excellent accompanying booklet that includes: a deeply analytical essay on the film titled The Reflecting Eye: Seeing Double in De Palma's Sisters by Kier-Ja Janisse; an extensive and honest interview with De Palma by Richard P. Rubinstein from the September 1973 issue of Filmmaker's Newsletter on the making of the film; a hugely entertaining piece by De Palma himself from Village Voice, October 11th 1973, entitled Murder by Moog: Scoring the Chill, in which he recalls the process of getting Herrmann on board and preparing the score; the 1966 article from Life magazine, Rare Study of Siamese Twins in Soviet, that was the partial inspiration for the film; details of the transfer; and plenty of stills. Has there been a better time to be a UK based cult film fan? With Masters of Cinema and Second Sight also producing some fine discs of favourites from years past, Arrow are no longer the only kids on the block in this regard, but the range and quality of their releases has consolidated their postion as THE distributor of cult cinema on UK Blu-ray and DVD. Sisters remains one of my favourite Brian De Palma films and its release here maintains the high quality set by Arrow's other recent releases, with a strong transfer and some first-class extras. Highly recommended.